Translational research — moving promising science out of laboratories and into clinical trials — is essential to getting vision-saving, retinal-disease treatments out to the millions who need them. With that said, translational research is also costly and high risk and requires extensive clinical development and regulatory knowledge. 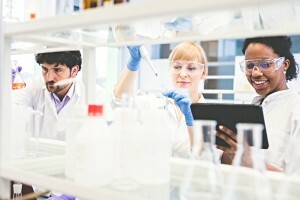 The Foundation Fighting Blindness has taken the translational challenge head on by investing more than $75 million in therapy-development projects with strong clinical-trial potential through its Translational Research Acceleration Program (TRAP), which includes Gund-Harrington Scholar Awards. Optogenetics is an innovative, emerging treatment approach for restoring vision in people with advanced vision loss. It involves delivery of light-sensing proteins to surviving retinal cells (e.g., bipolar, ganglion). Dr. Sahel and Botond Roska, MD, PhD, discovered that in a significant number of patients with advanced retinitis pigmentosa (RP), some cone photoreceptors go into a dormant, nonfunctional state. Dr. Dalkara discussed how dormant cones may be reactivated with an optogenetic therapy. The investigators believe that reactivated cones are likely to provide better vision than treated bipolar or ganglion cells. The team has made significant progress in designing and evaluating a cone-targeted optogenetic therapy for evaluation in a future clinical trial. Most of the light-sensing proteins used in emerging optogenetic approaches require extremely bright light to provide vision — light intensities that may be difficult to achieve unless the patient is outdoors in bright sunlight. The UC Berkeley team addressed this challenge by introducing a broad-spectrum, light-sensing protein native to the mammalian retina. The team is also developing an adeno-associated virus (AAV) delivery system that can effectively transfer the protein-expressing gene to the retina via an intravitreal injection. Injections into the vitreous are less invasive than those that are underneath the retina (i.e., subretinal). Dr. Kramer's team is developing a vision-restoring treatment they refer to as "optogenetics without the genetics." Instead of delivering genes that express light-sensing proteins, their approach is to deliver light-sensing drugs (photoswitch compounds). Unlike gene delivery, which is difficult to reverse, dosing of photoswitches can be easily modulated — increased, decreased, or stopped. Furthermore, Dr. Kramer's lab has shown that photoswitches naturally migrate to the areas of degeneration, so they are less likely to interfere with the function of surviving rods and cones. Their goals include further testing in large animal models and development of a slow-release, drug-delivery system. Antisense oligonucleotides (also known as ASOs and AONs) are small pieces of DNA designed to correct specific genetic mutations. Dr. Lentz and her team developed an ASO to correct the c.216>A mutation in the gene harmonin, which causes Usher syndrome type 1C (USH1C) in people with Acadian heritage. She demonstrated that her ASO treatment, delivered four times a year, improved harmonin expression in mice with the mutation. However, it is not clear if the level of improved expression would be sufficient to save or restore vision in humans with that mutation. She plans to evaluate other ASOs with the hope of increasing the production of the normal harmonin protein. Spinocerebellar ataxia type 7 (SCA7) is an autosomal dominant disorder that causes problems with mobility, speech, swallowing, as well as a cone-rod dystrophy that leads to blindness. Dr. La Spada has developed an ASO to treat the retinal degeneration. The ASO therapy has successfully prevented the production of the toxic protein causing retinal degeneration in an SCA7 mouse model. Dr. La Spada is also collaborating with Brian Brooks, MD, PhD, National Eye Institute, to launch a natural history study for people with SCA7 to identify the best outcome measures for a future ASO clinical trial for the retinal degeneration. Dr. Mumm has developed an innovative robotic drug-screening system to identify compounds that promote rod regeneration in zebrafish. His goal is to find a compound that can save vision in humans with retinitis pigmentosa (RP) and other retinal conditions that affect rod photoreceptors. Initially, he screened more than 2,900 compounds — each at six different concentration levels. In follow-up experiments, including testing promising candidates with rod cells and retinal tissue in a dish, he has identified four lead compounds, which he plans to evaluate in RP mouse models. He will also test combinations of molecules to determine if they perform better than individual compounds. Vitamin A, metabolized in the retina, is essential for vision. Many researchers believe that Stargardt disease, an inherited form of macular degeneration, is caused by the accumulation of toxic byproducts caused by the metabolic process. Dr. Petrukhin is developing a compound that blocks a protein known as retinal binding protein 4 (RBP4) — doing so reduces the accumulation of toxic vitamin A byproducts. He has shown that the drug reduces these toxins in a Stargardt disease mouse model. Dr. Petrukhin is optimizing the compound for evaluation in preclinical studies. Dr. Guziewicz demonstrated that her team's AAV-based gene therapy, delivering copies of the BEST1 gene, reversed the disease process in a canine model of Best disease, including animals with early and late stages of retinal degeneration. In collaboration with David Gamm, MD, PhD, at the University of Wisconsin—Madison, Dr. Guziewicz is evaluating the gene therapy in retinal pigment epithelial cells derived from human induced pluripotent stem cells to optimally design the treatment for use in a human study. She and her colleagues are also studying Best disease in humans to better understand disease progression and determine outcome measures for a future clinical trial. In collaboration with Luk Vandenberghe, PhD, Dr. Pierce has developed an AAV-based gene therapy for Leber congenital amaurosis caused by mutations in RPGRIP1. He is currently evaluating the latest version of the treatment in an RPGRIP1 mouse model. Future plans include generating a clinical-grade gene-therapy vector for toxicology studies, and ultimately, a clinical trial. Dr. Pierce's clinic has also identified seven families with RPGRIP1 mutations.